1 Games may take much longer or shorter depending on a deck's play style and the number of players. Call of Cthulhu: The Card Game (formerly the Call of Cthulhu Collectible Card Game) is a card game produced and marketed by Fantasy Flight Games. It is based on the fiction of the Cthulhu Mythos, primarily the writings of H. P. Lovecraft and Chaosium's Call of Cthulhu role-playing game. In 2008, Fantasy Flight moved the game over to its Living Card Game (LCG) format, which retains the deck-building aspect of collectible card games, but without the random distribution. It shares art and characters with FFG's other Cthulhu Mythos products Arkham Horror and Elder Sign. Chaosium had previously been involved in the collectible card game (CCG) business in the mid-1990s, printing Mythos, its Cthulhu mythos CCG. Chaosium discontinued the game in 1997 after poor sales. In 2004, Chaosium instead licensed the property to Fantasy Flight Games (FFG), allowing FFG to produce the official Call of Cthulhu Collectible Card Game. It was designed by Eric M. Lang as a more accessible introduction to gaming in the Mythos environment and to provide a fast and lively interplay with the usual elements of the mythos (e.g. arcane tomes and secrets, paranormal investigations, the elder gods and their terrible servants, dark sinister plots, inhuman conspiracies, and dangers from beyond the stars). The game is nominally set in 1928. FFG staffer Darrell Hardy developed the background for the game. Most of the storyline text (including card names and flavor text) was written by creative developer Pat Harrigan. In the Living Card Game format, the original story line was penned by Nate French, with the help of Dan Clark. Since 2010 all story lines have been created by the game's current developer Damon Stone. Players attach resources (taken from the cards in their hand) onto blank placeholder cards known as domains, later "draining" them by putting a drain counter on them to play various cards. Both players compete to complete stories by winning success tokens. Five success tokens wins a story; three stories wins the game. Players typically assign character cards to stories, to win struggles and gain these success tokens. Additionally, the first player to run out of cards to draw from loses the game, making deck destruction another potentially effective strategy. Five types of card exist in Call of Cthulhu: Story Cards, Character cards, Event cards, Support cards and Conspiracy cards. All cards (except story cards) have a cost and belong to a faction (described below). Various cards have subtypes (such as investigator, tome, or location). Story cards come from a shared deck, and are the object of the game. Players compete by placing "success tokens" on these story cards. Once a player has placed 5 success tokens they win the story, earning the option to execute (or ignore) the effect written on it. Once a player has 3 story cards they win the game. Standard players use the 10 latest story cards, of which 3 randomly chosen are in play at any time. The Nameless City is a special promotional Story card that requires 10 success tokens but allows a player to win the game instantly. Another promotional story card is named "The Challenge From Beyond" (after a story written in collaboration by H.P. Lovecraft and four of his correspondents), and has the opposite effect: it cannot be won like a normal story, but players may draw extra cards by scoring "successes" at it. Character cards are a player's agents, used to attempt to complete stories. They possess a skill rating (used to succeed at stories) and may also have icons, which indicate the card's abilities during the icon struggle phase of play. Event cards have one-time effects and do not remain in play. Conspiracies are introduced in "Conspiracies of Chaos." These function similar as Story cards but are played from the players' decks. There are eight factions in Call of Cthulhu, as well as "neutral" cards (light grey in color) that are not part of any faction. A card may only be played if a domain with that faction attached is drained (neutral cards can be paid for using any faction). The Agency: This "investigator" faction comprises the Blackwood Detective Agency, law enforcement agencies, and others involved in criminal justice. Its symbol is a badge, and its color is blue. Miskatonic University: This "investigator" faction represents the academic prowess of Lovecraft's fictional Miskatonic University, as well as other academic groups. Its symbol is a scroll, and its color is gold. The Syndicate: This "investigator" faction represents the underworld element of human society, including mobsters, killers and journalists. It mainly focuses on Danny O'Bannion's gang and its contacts. Its symbol is a dollar sign in a triangle and its color is dark brown. The Order of the Silver Twilight : This "investigator" faction is a later addition to the game and centers a secret cabal of leading politicians, charismatic socialites, persuasive civic leaders, and successful businessmen who must pass through successive ranks of occult initiation and ritual to emerge into the inner sanctum of the Order, there to pursue their quest for ultimate earthly - and unearthly - power. Its symbol is a trident in a cross, and its color is silver grey. Their name may be a play on The Hermetic Order of the Golden Dawn. Cthulhu: This "mythos" faction includes Cthulhu himself, as well as his associated cultists and monsters (such as deep ones and shoggoths). Its symbol is a squid, and its color is green. Hastur: This "mythos" faction centers on Hastur, especially his King in Yellow aspect, as well as his worshippers and minions, largely human psychopaths and monstrous Byakhees, as well as werewolves. Its symbol is the Yellow Sign, and its color is yellow. Yog-Sothoth: This "mythos" faction centers on Yog-Sothoth, and the scholars who worship it, as well as various trans-dimensional beings including Nightgaunts and Star vampires; it also hosts several undead monsters. Its symbol is a key, and its color is purple. Shub-Niggurath: This "mythos" faction centers on Shub-Niggurath and the many, many monsters she is responsible for creating (notably Dark Young, ghouls, and Dholes). Its symbol is a goat's head, and its color is red. The Call of Cthulhu card game is currently produced in the form of a core set, featuring cards from 7 factions, neutral cards, story cards, success/wound tokens, a full-colour manual, a game board, and Cthulhu-shaped domain markers. (The 8th faction, Order of the Silver Twilight, does not appear in the core set.) The game is ready to play and decks can be made quickly by combining cards from two of the factions along with several neutral cards. Older products may still be available from retailers, though these cards have black borders and different backs. Official tournaments so far have been "white border only", so it is not necessary to chase down the older cards. The only reasons to do so are for fun or to complete a collection, though if intended for play, sleeves are required to disguise the different backs. Arkham Edition and Eldritch Edition also included "Premium Starter Sets" that contain two playable decks, primarily consisting of reprints from the normal sets, and a series of promo cards given as attendance awards for participating in official tournaments. Each booster pack contains 11 cards (including 3 'uncommon' and 1 'rare'). In addition, the Arkham and Eldritch base sets offered starter sets with fixed contents, designed to introduce players to the game. In May 2006, Fantasy Flight Games announced their decision to cease releasing cards in a CCG format, and to instead begin releasing smaller sets of cards as single decks with fixed contents in the LCG format. These "Asylum Packs" would be released once-a-month, and were initially designed to be compatible with the CCG cards. Released approximately once a month, these expansions were designed to increase the players' card pool in a balanced and affordable way. Three copies of twenty new cards are introduced in each pack, for a total of 60 cards. The initial printings of the sets included varying quantities of each card to echo the rare, uncommon, and common rarities of the original game, and this distribution may still be found in some out-of-print packs. Casual gamers can play using a single core set and have the option of using supplemental packs if they want to. Asylum Pack III - Conspiracies of Chaos cover. The Asylum Packs proved to be very popular, encouraging Fantasy Flight to convert the entire game into the LCG format. 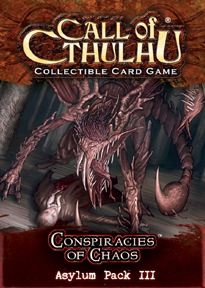 On February 5, 2008, Fantasy Flight announced that they would be publishing a new "Core Set" of cards in October 2008, incompatible with the original CCG cards, and that two additional Asylum Packs, The Mountains of Madness and Ancient Horrors, would be published to follow the existing Asylum Packs and complete the first cycle, "Forgotten Lore"; all six packs were reprinted in 2011 as pieces of a unified set, with a single set icon and continuous numbering. Fantasy Flight continued printing monthly Asylum Packs, arranged into six-piece cycles, for several years. In July 2012, Fantasy Flight announced that they would switch to a new distribution model: instead of the near-monthly Asylum Packs, there would be one 165-card deluxe expansion every four months, beginning with Seekers of Knowledge. Secrets of Arkham (110 cards) Fantasy Flight has announced that the reprint will have 3 copies of each player card (i.e. 150 deck cards and 10 story cards), like the other deluxe expansions. It will be released early 2014. The first-place finisher challenges the Yithian deck, as played by the tournament organizer. If the first-place finisher is defeated, the second-place finisher takes his spot, and so on. All challengers must use the same deck they played in the tourney. The first player to defeat the Yithian deck takes a copy of the deck home. The winners of the Call of Cthulhu World Championship are invited to design a card that is released within the other products. These cards usually have a high power level, and the art features the likeness of the person that designed it. 2005 World Champion Greg Gan designed the card "Assistant to Dr. West" which bears his likeness, as drawn by Patrick McEvoy. It appears in the Forgotten Cities expansion. 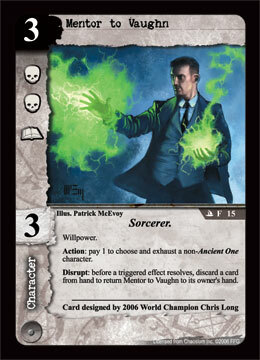 2006 World Champion Chris Long designed the card "Mentor to Vaughn" which bears his likeness, as drawn by Patrick McEvoy. It appears in Kingsport Dreams: Asylum Pack II. 2007 World Champion Jim Black designed the card "Descendant of Eibon" which bears his likeness. It was shown at Gen Con 2008 and will be released in a later Asylum Pack. At Gen Con Indianapolis 2005, Gregory Gan of Pittsburgh, PA became the first Call of Cthulhu CCG World Champion. 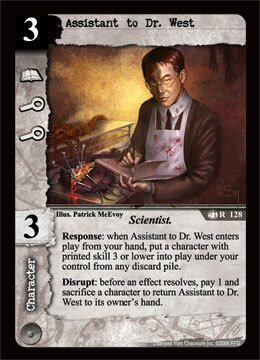 His card, Assistant to Dr. West (bearing his likeness), was printed in the Forgotten Cities set in the Eldritch Edition block. The card art bears his likeness as drawn by Patrick McEvoy. At Gen Con Indianapolis 2006, Christopher Long of State College, PA became the second Call of Cthulhu CCG World Champion. Mr. Long has designed his card, and it is featured in the second Asylum deck that has been released January 2007. The card art bears his likeness as drawn by Patrick McEvoy. It also features Long's name in the text box. At Gen Con Indianapolis 2007 James 'Jim' Black of Pittsburgh, PA became the third Call of Cthulhu CCG World Champion. In the winning match he had both Assistant to Dr West and Mentor to Vaughn in play. On December 18, 2012, Fantasy Flight announced retailer-incentive "Game Night Kits", meant to serve as demo kits and encourage new players to get into the series. The kits include alternate art versions of existing cards to be used as prizes, as well as a unique deck box, promotional poster, and two sets of specialized wound tokens. Fantasy Flight Games have set up the Servitor program to help tournament organizers by giving tournament support, like promo cards, Sanity Certificates and access to special promotional items like the Yithian Deck, to give away as prizes. Older products in the line come with Sanity Points on the packaging, which range from 1 Sanity Point on boosters, to 5 on Asylum packs. Servitors are given Sanity Certificates to hand out to tournament winners. These Sanity Points could be redeemed until June 30, 2008 for items like promo cards or T-shirts. In 2005, Flagship magazine awarded the Call of Cthulhu CCG the title "Best Card Game of 2005." In 2008, InQuest Gamer magazine voted the Call of Cthulhu CCG the number 57 ranking Game of All Time saying that it "broke new ground with domain-based resource mechanics and great integration of the requisite horror and madness themes." On the 22 of September 2015, it was announced that Fantasy Flight Games ceases all tournament support and stops developing new expansions after 2015 World Championship. With that, The Mark of Madness expansion, focusing on Hastur faction was the last expansion of the game which essentially completed a cycle of expansions for all 8 Call of Cthulhu factions. In total the game had 10 deluxe box expansions and 7 cycles of 6 asylum packs through the years. Fantasy Flight Games announced that they will keep the ability to reprint already released expansions on demand. Mythos, a collectible card game based on the Cthulhu Mythos universe.